Chocolates on display at Aurora Grace Chocolates, located at 517 S. Fifth St. in Philadelphia on Friday, Jan. 04, 2019. Wold is a self-taught pastry chef who made her mark at NYC's Jean Georges and Eleven Madison Park. Philadelphia has a long, sweet history with the chocolate industry. It started with the likes of Milton Hershey, who established his first candy store on Spring Garden Street in 1876, and continued with big names such as Asher’s and Whitman’s. But go beyond the big-name brands and you’ll find many talented chocolatiers putting out single-origin chocolate bars, intricate buttercreams, and hand-rolled truffles. Here are 10 shops — both decades-old candy stores and bean-to-bar-minded newcomers — for buying locally made chocolates (plus a bonus option fit for a daytrip). Many stores also offer tastings and tours. At this Society Hill confectionery, 24-year-old pastry chef Aurora Wold crafts exceptionally stunning chocolates. Her specialty is hand-painting dark-chocolate-encased bonbons, a process that can take days. Layers of flavors hide inside these one-bite desserts, including banana caramel, graham, and walnut praline; maple caramel and olive oil ganache; and dulce de leche and caramelized white chocolate. This 156-year-old storefront got a makeover in 2011, when it was reopened by the Willy Wonka-esque Berley brothers, owners of the nearby Franklin Fountain. The Old City outfit takes a bean-to-bar approach, sourcing cacao from around the world, then processing it in house. The products include creamy truffles, hand-dipped pretzels, brandied cherries, lavender and honey caramels, and bars with up to 90 percent chocolate, as well as a wide selection of other candies. Sign up for a monthly tasting and tour, and try a cup of thick, velvety drinking cocoa while you’re there. The Berley brothers, Eric (left) and Ryan, run Shane Confectionery, helping keep alive a storied part of the city's past. PHL Made volunteers hope to brand all fashion, food, music, and more made in the city. Many of the chocolates in this 50-year-old, family-owned store are made in the former Goldenberg’s Peanut Chews factory, where co-owner Tony Walter Sr. worked for a time. But don’t expect the sweets here to resemble those iconic, molasses-y candy bars. In addition to caramels and marshmallow covered in milk and dark chocolate, the Washington Square shop offers the classics, like solid chocolate hearts, nonpareils, buttercreams, and toffee. This couple-owned outfit brings a colorful spread to several area farmers’ markets with items like red- and black-painted dark chocolate ganache “ladybugs” and bright yellow honey-caramel “honeybees.” Other best sellers include chocolate-dipped figs filled with whiskey ganache and peanut butter praline squares coated in dark chocolate. Find the chocolatiers’ many treats at the markets, stores like Green Aisle Grocery and Di Bruno Bros., or online. Joseph and Antonie Amrani own this sunny Ardmore cafe and shop. French-born and Georges Perrier-trained, the brothers turn out delicious macarons and croque monsieurs, but you won’t want to leave here without chocolate. Find truffles filled with ganache, hazelnut praline, and Delice’s own take on Ferrero Rocher, featuring a layered interior of Italian coconut wafers, rice crispy, caramel, and dark chocolate. Christopher Curtin spent more than a dozen years studying pastry and confectionery in Belgium, Switzerland, France, Germany, and Japan. He opened his small shop in West Chester in 2005 and has garnered national recognition in the years since. Bars come spiced with flavors like coffee and cardamom, green tea and roasted rice, and porcini and thyme; other treats, such as Peruvian truffles rolled in Venezuelan cocoa powder, are available, too. Look for Éclat products at retailers like Di Bruno Bros. and Whole Foods. Three generations of Giambris have helmed this chocolate business, founded in South Philadelphia in 1942. Chocolate-covered pretzels are their biggest seller, but the family doesn’t shy away from dipping more unusual things — such as potato chips and Oreos — in dark and milk chocolate. Classics like nonpareils, buttercreams, and caramels sell year-round, while other treats are more seasonal, including chocolate eggs and hand-pulled lemon sticks (staples of the Devon Horse Show). Husband and wife Mark and Deb Pellegrino have brought bean-to-bar chocolate to the New Jersey Shore. Sourcing from around the world, the duo roasts and grinds cacao beans, then crafts single-origin chocolate bars inside their Atlantic City shop. Find dark chocolate, milk chocolate, sea salt, and orange, or request a custom creation. Visitors to the shop can watch the production process, do a chocolate tasting, and order drinks and snacks from Made’s fully stocked bar. Co-owner Deb Pellegrino cups a handful of raw cacao beans from Ghana, which she will transform into memorable chocolate bars, cocktails and desserts at Made Atlantic City Chocolate Bar in Atlantic City. For a sweet adventure, visit this West Berlin operation and sign up for a chocolate-making course, a guided tour, or a tasting. This family company started crafting chocolates more than 70 years ago in France, not far from Paris; it opened the New Jersey outpost in 2012. Find bars studded with roasted pecans and figs, truffles with dark chocolate ganache, chocolate disks with diced orange and nuts, milk chocolate-covered macarons, and more. Next year will mark 100 years of business for this old-school South Jersey candy store, which has stayed in the same family for four generations. 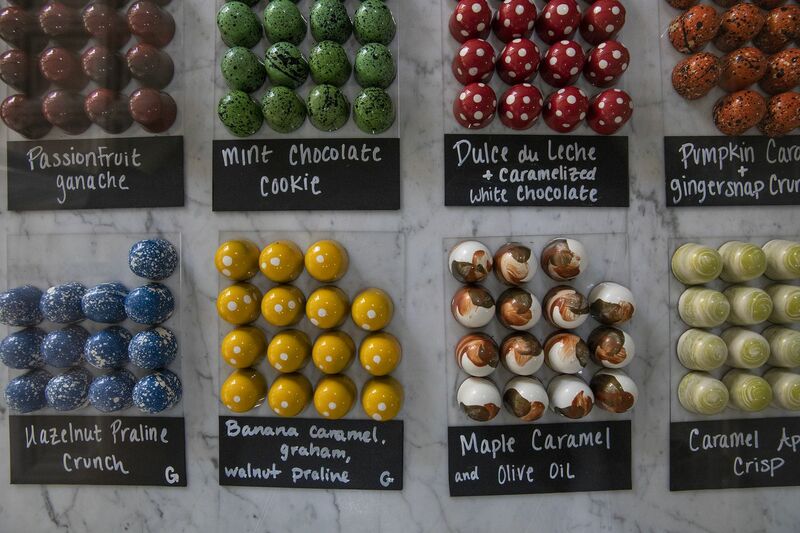 Swing by the Merchantville factory for a quick tour — all candy-making happens on the second floor — and then indulge in array of classic novelties, including buttercreams, clusters, and truffles. The single-origin chocolate bars at this Chambersburg, Pa., shop are worth the drive (make an agritourism day of it with trips to a nearby brewery and creamery). Aside from several bars made with almost 75 percent chocolate, try flavored options, such as buttermilk, gingerbread, strawberry-rye whiskey, everything (bagel-inspired), and pretzel-cherry. Keep an eye out for the small-batch producer’s goods in Philly-based retailers and cafes, including Primal Supply, Weckerly’s Ice Cream, and Two Person Coffee, or order online. Each bar comes beautifully wrapped in handmade paper.